Despite Promises, Elderly Evicted From Housing John Myers was evicted from his assisted living facility two months before his death. He is just one of scores of elderly people evicted after Assisted Living Concepts broke promises to accept Medicaid funds. A New Jersey report finds that assisted living facilities across the country are not regulated adequately, and that the already vulnerable elderly are "ripe for exploitation." 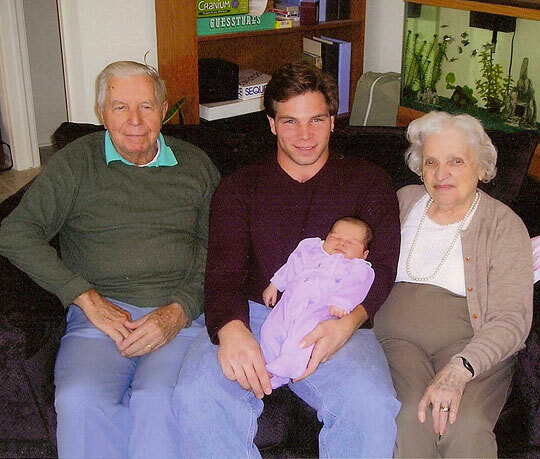 John and Mae Myers sit with their grandson, Stephen Paulin, and his daughter Emily. John Myers died in February, shortly after being evicted from an assisted living facility in New Jersey. A state official in New Jersey has reviewed the cases of scores of elderly people who were kicked out of assisted living facilities — simply because they could no longer pay at the highest rates. In a new report, Ron Chen, the state's public advocate, concludes that state regulations in New Jersey and around the country fail to protect elderly residents. At a press conference in Trenton, Chen, surrounded by family members of people who had been residents of assisted living facilities, called for tougher regulation of the assisted living industry. "Our statutes and regulations that govern the assisted living industry are not strong enough," he said, "and we need to reform them to better protect our parents and our grandparents." Chen recommended that all assisted living facilities in New Jersey be required to set aside at least 10 percent of their beds for residents who rely on Medicaid, the state insurance program for the poor and uninsured. And he called for tougher rules to force facilities to clearly state their policies on the cost of care. The recommendations were in response to a finding that, in New Jersey, dozens of residents of assisted living facilities run by Assisted Living Concepts had been forced out of facilities when their money ran out, even though they had been given oral promises that they would be able to use Medicaid funds. Assisted living has emerged as a popular alternative to a nursing home because residents get their own private apartment and can leave cooking, cleaning and minor health care to staff. But assisted living is expensive and, in most cases, it's not covered by insurance. John Myers, 93, and his wife, Mae, 88, went through about $180,000 of their savings in three years at an Assisted Living Concepts facility in Burlington, N.J. But late last year, John Myers lost a lot of his money in the stock market. The family asked about going on Medicaid; that would have meant they would pay about 20 percent less, according to Chen's report. Instead, they were evicted. The couple's daughter, Pam Paulin, was stunned. "Right before Christmas?" she says. "You send out a notice that you're going to evict my parents?" She says they had chosen the facility — which they loved living in — after they had been promised they could stay even if they outlived their savings. 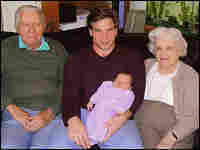 Between the time her parents moved in, in November 2005, and when they were evicted, there were new owners of the facility. In its facilities across the country, Assisted Living Concepts changed the commitment to residents who had gone through their savings. The original owners of Assisted Living Concepts, which was one of the country's first assisted living companies, had made a point of serving middle-class elderly at a time when other companies sought out wealthier people who could pay higher fees. The company's efforts in the past two years to evict poorer residents has been criticized, privately, by others in the assisted living industry. Assisted Living Concepts did not respond to a request for an interview. In the past, they've said there are limits on how many Medicaid patients they can take and still provide good care. That's not good enough for Chen, New Jersey's public advocate. He says the company made a promise to state regulators when it built its facilities that it would serve people with moderate incomes or who had gone through their life savings paying fees at the facilities. Chen started hearing complaints from residents and last year opened an investigation. Chen's office contacted hundreds of families who had loved ones in one of the company's eight facilities in the state. In the report released Thursday, Chen found that dozens of elderly people were promised they could stay at the company's facilities in New Jersey — and then got kicked out. "This is also by definition a vulnerable population," says Chen. "Elderly citizens living usually on fixed incomes, or no incomes, who can be ripe for exploitation if there's not some type of regulation." Any change will come too late for Paulin and her parents. Shortly after the eviction notice came, her father, who had been in good health before, was hospitalized. "I think this was a lot of stress for him," she says. "I just think that this really wore him down." Myers died in February. His wife, who depended upon him for care, also had a steep decline in health. She left the assisted living facility and now lives in a nursing home.